AMAZING HOW THINGS FALL INTO PLACE SO PERFECTLY... AFTER KAHEALANI & THE HAWAI'I GANG RETURNS BACK HOME TO HAWAI'I NEI, MY DOCTOR FINALLY CLEARED ME TO RETURN BACK TO WORK AT ONE OF MY JOB, THE BETHEL YOUTH FACILITY. IT WAS A SAD MOMENT FOR ME AS I WAS ALREADY STARTING TO MISS MY ANCHORAGE & SEWARD OHANA. THROUGHOUT MY ENTIRE STAY AND RECOVERY IN ANCHORAGE, THEY TOOK GREAT CARE OF ME AND TO ME THAT MEANT SO MUCH TO ME AND I AM FOREVER GRATEFUL AND THEY HAVE DEFINITELY EARNED MY LOYALTY FOR LIFE!!! MY AWESOME & BEAUTIFUL VICKIE TOOK ME OUT TO MY FIRST BINGO EVER!!! ALTHOUGH WE DIDN'T WIN ANYTHING, OUR TIME TOGETHER WAS PRICELESS!!! NEXT STOP... THE "PALMER ALEHOUSE" - THE ALASKA ALE HOUSE FOR SOME SHOTS!!! TEQUILA VS VODKA... AND THE WINNER IS... WAIPA & ATI!!! MY LASTWEEKEND AT WILLAWAW WITH OHANA!!! THAT NIGHT WAS EPIC, WELL ALMOST EPIC... LOL!!! I HAD WAY TOO MUCH TOO DRINK AND I GOT ASKED TO LEAVE... SO LET'S LEAVE IT AT THAT... LOL!!! THE NEXT DAY I HEADED OVER TO GO SEE H3 PLAY AT A PRIVATE BIRTHDAY PARTY!!! IT WAS BEAUTIFUL AND CLEAR AFTERNOON WITH GREAT MUSIC FROM H3 AND GOOD COMPANY!!! LATER ON THAT EVENING WE MET UP WITH 2 OF OUR BEST FREINDS WHO IS ALSO OHANA TO ME FROM SEWARD!!! THE FOODS WAS AMAZING, ESPECIALLY THE FRESH MADE PRETZEL WITH BEER CHEESE SAUCE, I COULDN'T EVEN FINISH AND ENDED UP TAKING IT HOME. BUT IT WAS GOOD SEEING AND CHATTING UP AND LAUGHING UP GOOD STORIES WITH EACH OTHER. THE NEXT DAY... IT WAS MY FINAL AND LAST DAY AND HOMEMADE MEAL FROM NONE OTHER THAN MY OLD DEAR FRIEND AND SISTER, DENISE. DENISE'S FATHER AND VICKY COOKED AN AMAZING MEAL FOR ME AND MY MOM. OH I FORGOT TO MENTION, MOM FLEW INTO ANCHORAGE FOR A MEDICAL APPOINTMENT, SO WE BOTH WERE INVITED. SALMON LOX, STICKY JASMINE RICE, PEANUT OXTAIL, BOK CHOY SALAD, LONG GREEN BEANS, THAI SWEET & SPICY SHRIMPS, AND BLUEBERRY CHEESCAKE!!! TALK ABOUT A MEAL FOR A KING, I WAS SO FULL AND BLESSED AT THE SAME TIME. IT WAS A SAD FEELING KNOWING I WAS LEAVING BACK TO BETHEL THE NEXT DAY BUT I'M SO FORTUNATE AND I MUST NEVER EVER FORGET THAT. AS SOON AS I LANDED IN BETHEL, I'LL BE HONEST, I DID NOT WANT TO GET OFF THE PLANE. BUT WHEN I DID, I JUST KEPT ON GOING TRYING NOT TO BE ENGAGED IN ANY CONVERSATIONS AS I WAS NOT UP TO IT AT THE MOMENT. I DECIDED TO SPEND THE NEXT FEW DAYS AT MY MOM'S AS I REALLY DIDN'T WANT TO BE ALONE IN MY HOUSE UNTIL I COULD ADJUST TO BETHEL... LOL!!! I WANT TO ONE AGAIN THANK EVERYONE IN ANCHORAGE WHO HAS MADE MY STAY VERY ENJOYABLE, ACCOMODATING, AND BEING WELL CARED FOR WHILE I WAS IN RECOVERY. TO THE FOLLOWING: THE PACARRO OHANA, THE MORIARTY OHANA, THE NOGA OHANA, CHRIS & SHANNON, DENISE & VANG, VICKIE & OHANA, KA'IWA & KEKOA, SAMART, ALEX, LEE, FRANK, TERRY, AND MY OHANA. 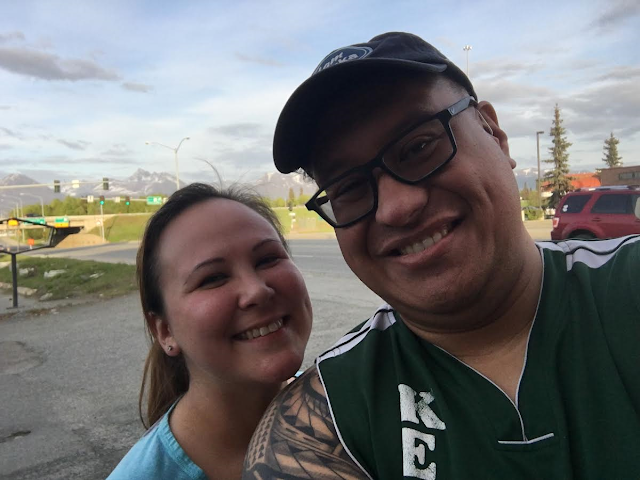 I CANNOT EXPRESS ENOUGH HOW GRATEFUL I AM TO BE PART OF YOUR BEAUTIFUL LIVES AND I AM FOREVER GRATEFUL TO EVERY ONE OF YOU FOR TAKING ME IN AS YOUR OWN, I WILL NEVER EVER FORGET THE BIG AND SMALL THINGS YOU'VE DONE FOR ME AND KAHEALANI WHILE WE WERE IN ANCHORAGE AND SEWARD. YOU ALL GAVE ME HOPE AND STRENGTH TO CONTINUE TO BE WHO I AM AND DO I WHAT I DO BEST!!! ALOHA IS NOT A FEELING, ITS A WONDERFUL AND BEAUTIFUL LIFESTYLE!!! LOVE AND ALOHA TO EVERY ONE OF YOU!! !